The program that Pirika provide. Reliable methods for estimating the vapor pressures of organic materials are of increasing importance as a tool in predicting the behavior and fate of chemicals that are introduced into the environment. When a chemical like a CFC or HFC has been spilled, for example, we must know its approximate vapor pressure in order to estimate its rate of evaporation, Ozone Depletion Potential (ODP) and Global Warming Potential(GWP). Without information of vapor pressure, we can not get ODP and GWP. The persistence of environmental hormones, insecticides, herbicides, and similar substances that have been absorbed in the soil is also highly dependent on this chemical specific property. The most popular VP estimation method is Riedel scheme I think. This Riedel scheme is one kind of corresponding state theory. You can calculate VP with this scheme if you know the Tc, Pc and Boiling point. If you enter (Tb,760mmHg), (Tc, Pc) then the answer become complete. This means Riedel VP curve pass through these point. 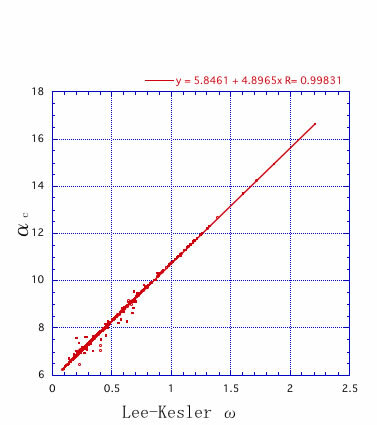 And if αc=3.758, then Q become 0, and A, B, D also become 0. Riedel VP curve also pass through this point. 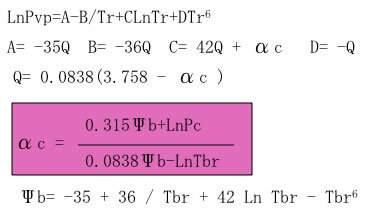 The point that αc(C) become 3.758 is above Boiling Point, so Riedel equation is much accurate at higher temperature. I judged this method with the data that are listed in "The properties of Gases & Liquids". 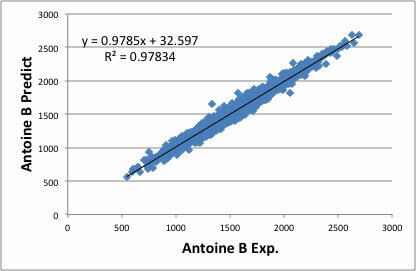 I used random function and generate several temperatur within Antoine upper and lower limit. 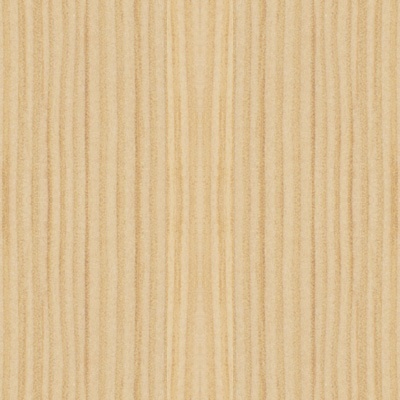 And plot Antoine result to Riedel result. 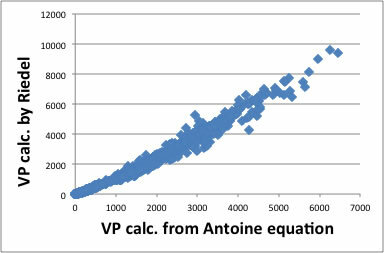 (I assumed Antoine VP is much reliable. So think it as Experimental data.) It seems that at lower VP, it agree very well. Lee-Kesler method is also one kind of corresponding state theory and predict with this scheme. ω is called acentric factor. You can easily find out from this equation, upper part of ω is similar with f(0)(Tr) and lower part of ω is same with f(1)(Tr). So, if you enter Tb to Tmes (measurement temperature of VP), Tr become same with θ and it remain only -ln(Pc) at right equation. In this case, Vapor Pressure unit is atm so lnP=0, so P become 1 atm. So this VP curve pass through (Tb,1atm). If you enter Tc to Tmes, Tr become 1. If you enter Tr=1 to f(0)(Tr)= 7e-5, f(1)(Tr)=7e-6, ω is smaller than 2 so, right side of equation become e-4. So, pressure become almost same with Critical pressure (Pc). So this VP curve also pass through Critical point. I also checked accuracy, result is almost same with Riedel equation. If I polt αｃand ω, we can easily find out these two index say same thing. And the performance of these two equations is almost same. There are other corresponding state theory to calculate vapor pressure, but every equations are set pass through (Tb, 1atm), (Tc, Pc) and one more point, so the result is almost similar. This nature is very problematic to ESTIMATE VAPOR PRESSURE. There is so few experimental critical data are available. So, we use these equation with estimated Critical point data. But these equations force to pass through these estimated critical points. 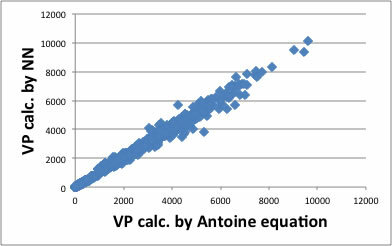 This lead large error of VP estimation. I also build neural network type of VP estimation scheme to predict VP and put it on Pirika site. With this NN scheme, these restriction(pass through (Tb, 1atm), (Tc, Pc)) is not added. So the accuracy is not so good compare to corresponding state scheme if you enter experimental critical point and boiling point. But these data are estimated value, NN return much better answer. For YNU-simulator, I implement the function that estimate Antoine B and C parameter from chemical structure. 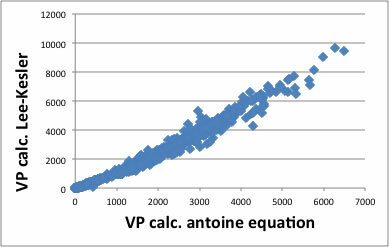 If we have only one experimental (Tmes, VP) data, we can calculate Antoine A parameter. I can do this because I develop new Antoine parameter fitting program that answer very stable and insightful of Thermo Chemical nature. And I also implement new algorithm to predict Critical point estimation, so result will become much better. 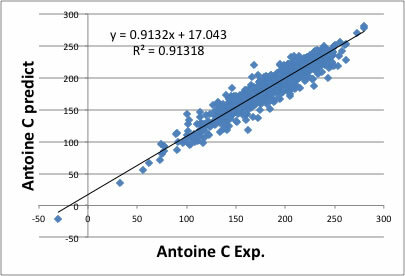 The correlation of Antoine B parameter prediction become like below chart that are made from 2178 compounds with 167 functional groups. I implement this result into YNU-simulator. Antoine C parmeter become like this. Unfortunately, Antoine A parameter can not predict from molecular structure. I determined Antoine A parameter from experimental (Tmes, VP) data. If data is not available, predicted boiling point is used.